BMW has fired up the configuration page for the new 4 Series Coupe on the BMWUSA.com website – giving prospective buyers and dreamers alike the chance to build their ideal coupe formerly known as the 3 Series with prices beginning at $41,425. When you first enter the Build Your Own area on the BMW website and pick the new 4 Series Coupe, you are presented with 4 options – the 428i, the 435i and the xDrive versions of each. The 428i in rear drive form starts at $40,500 while the 428i xDrive starts $2,000 higher. The 435i starts at $46,000 and like the 4-cylinder models; the 6 cylinder 435i xDrive costs $2,000 more than its rear drive counterpart. After you have picked the specific model of your ideal 2014 BMW 4 Series Coupe, you are given four trimlines including standard, Luxury, Sport and M Sport. For 428i and 428i xDrive buyers, the Luxury package costs $1,700, the Sport package costs $2,100 and the M Sport package will set you back $3,500 while those packages cost slightly less for 435i buyers with prices of $1,400, $1,700 and $3,100 for the Luxury, Sport and M Sport, respectively. Once you have chosen which specific model and trimline of the 2014 BMW 4 Series best suits your needs, you are whisked away to another page in the configurator tool that offers you an incredible amount of customization – a feature which has become the norm for BMW. First, the exterior section allows you to pick between 11 different colors (number varies based on the model and package chosen) with 2 of those colors – non metallic Jet Black and Alpine White – coming with no additional charge. The other nine colors are all metallic and they all add an extra $550 to the final price of the BMW 4 Series. Also, if you have opted for the M Sport package, you can choose between a few different 18 inch wheel options. Next, the interior area allows you to pick between a variety of leather or “leatherette” upholstery colors for the 2014 BMW 4 Series Coupe along with a couple different trim and accent packages. You then get to scan through a massive option package list including the Cold Weather package ($700), Driver Assistance package ($950), Dynamic Handling package ($1,000), Premium package ($2,200), Touchpad Navigation ($2,150), Lighting package ($1,900), and Technology package ($3,150) – with all of these packages being priced the same across the entire model range. All of these packages can be equipped together except for the Driver Assistance Package II and the Technology package. The options and accessories for the 2014 BMW 4 Series Coupe are so many that it would be fruitless for me to try to run through them all. Instead, we will look at the most expensive and least expensive options for prospective buyers. Those who want to get into the 2014 BMW 4 Series Coupe as inexpensively as possible can opt for the 428i, rear wheel drive model in either Jet Black or Alpine White. On the inside, either Black or Venetian Beige Leatherette will cover the seat with either an automatic or manual transmission. The price of this stripped down BMW 4 Series Coupe is $41,425. On the other hand, the BMW 4 Series buyer who wants the most will want to opt for the new 435i xDrive ($48,000) with the M Sport package ($3,100). When you build the M Sport equipped 435i xDrive with Melbourne Metallic Red ($550),Red Leather interior with Black accents and aluminum trim, the Cold Weather, Dynamic Handling, Premium, Lighting and Technology Packages – the price quickly climbs up over the $63,000 mark. There are also lots of ala carte options like 19” lightweight wheels that are paired with M Sport brakes on the non-M Sport equipped coupes, a Harman Kardon sound system and an exterior camera system that can bring the price up over $65,000 so while you CAN get into the new 4 Series Coupe for just over $40k – you can also put together one loaded up, high priced BMW 2-door. 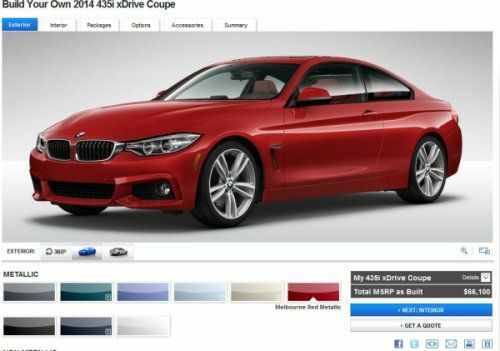 Click here to head over to the BMW USA website to build your own 2014 BMW 4 Series.